This simple decorating tips post is brought to you by Target and Glam media. All opinions are my own. My husband and I met in college and got married soon after. Our first house together was small and seriously lacking in amenities. With my husband going to grad school, we didn’t have a lot of money for extras. Our house was decorated with a combination of hand me downs, Goodwill finds and things our neighbors left on the curb. Needless to say, our house didn’t have a lot of style back then! Over the years, we have moved a few times, invested in some new furniture and moved up in the world a bit. However, the one place that we have barely touched in terms of decorating is our bedroom. Why? Because no one sees it but us! It has always seemed frivolous to decorate a space that no one but my husband and I see but lately the lack of style in my bedroom is starting to bug me. This is my completely undecorated bedroom. I am actually appalled to put this on here! Nothing matches, the nightstands are cluttered and it has no sense of style what so ever. Other than the mattress and box spring, it is all second hand, clearance, and Goodwill decor. Functional, yes, but highly unattractive. I have recently decided that things need to change and when I got the chance to work with Target to showcase their new Threshold line, I decided this was the perfect opportunity to bring some style into my inner sanctum. As I browsed through the Target Threshold selection, I started analyzing my own creative style and thought that I would share some of the simple decorating tips that I came up with while I was shopping. 1. Decide what can stay from your current decor and then find things that match: Our budget for decorating did not include replacing furniture so the bed, nightstand and bureaus were going to stay. The one other item in our bedroom that I really liked was my lamp. The wrought iron look of the base and olive green velvet shade is a nice balance of rustic and elegant. The Target Threshold line had a number of different comforter styles to choose from and I found a beautiful one that had a simple pattern of green, yellow, and off white. It brought a light airiness to the bedroom that was very refreshing. It also matches my lamp shade beautifully! Instead of ditching my perfectly good lamp and buying a matching set for each nightstand, I found a simple black lamp base from the Target Threshold line that was similar enough to my current lamp to look like it belonged in the room. I am far too practical to ditch perfectly good decor items if I don’t need to. When you set out to decorate your living space, decide what can be saved and what absolutely has to go! You may even want to browse through other rooms of your home to see if something that is out of place in one room would match the new decor. I found a bright yellow blanket in the living room that matched my new throw pillows perfectly. 2. Choose natural and organic decor items when available and affordable: I have been looking for organic sheets for months but was discouraged by the prices of most manufacturers. 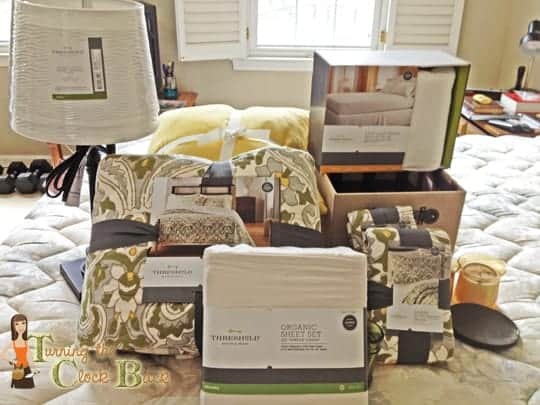 I was thrilled to find out that the Target Threshold line offers a number of different styles of organic sheets and several organic blankets as well. The prices of the organic Threshold sheets and blankets were incredibly reasonable. Other natural decor materials to consider are wooden baskets for storage, soy candles, live plants, etc. I loved the organic sheets I bought and they feel very soft. I chose a neutral off white to match my new bedspread. 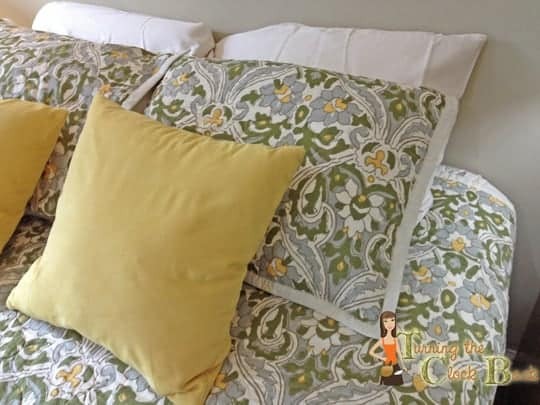 They had a wide variety of colors to choose from which matched nicely with the assortment of comforters and bedspreads they offered. I chose a bedspread rather than a comforter because it is easier to wash in a regular washing machine. I don’t like having to take bedding to the dry cleaners since having a dog on my bed means I wash the bedding fairly frequently! 3. Think outside the room you are decorating when you shop: When I was choosing the decor for my new bedroom I browsed through all of the Target departments and was thrilled to see that the colors in the Threshold line extend throughout all of different departments. I found a glass in the Target bathroom section that matched perfectly with my bedspread. Why do I need a glass in my bedroom? 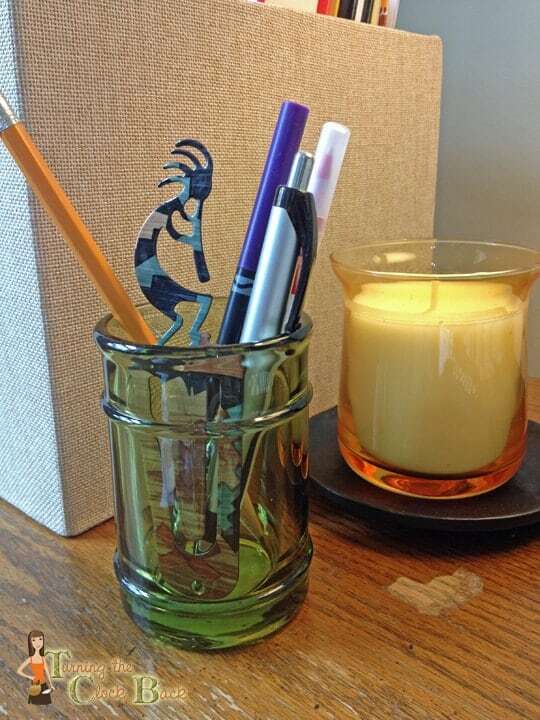 To hold my husband’s pens and pencils that he keeps on his nightstand. He often does Sudoku puzzles, takes notes in his books, and writes in his journal. Instead of having scattered writing utensils all over the nightstand, he now has a nice organized way to store them. You may also find baskets in the kitchen department, or a nice vase in the outdoor living section. Make sure to take a good look around and imagine how your decor could include unusual items. 4. Keep your space organized! I tend to look at every room in my house and ask myself how I can keep it more organized and hide clutter more effectively. Baskets are a great way to keep your space more organized. My husband and I love to read and our nightstands are always cluttered with books and magazines. It drives me nuts because it makes it almost impossible to keep the dust from piling up. I found some very attractive baskets in the Target Threshold line that are now keeping our reading material more organized. That way, I just pick up the basket in order to dust. 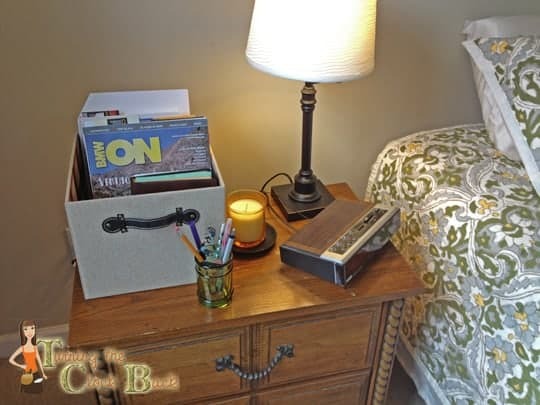 Baskets are also great for holding remote controls or anything else that tends to create clutter on your bedside table. The basket I found to hold his books and magazines is very attractive and they had several sizes to choose from. The color and style are just a tad bit trendy but neutral enough to be very versatile. 5. Tie in your colors with accessories: I tend to prefer neutral colors for rugs and walls because those items are hard to change if I want to redecorate in the future. I like to add splashes of color with smaller items like throw pillows, candles, etc. I found some beautiful metal candle dishes in the Threshold line that matched the new lamp I bought beautifully. The candle not only adds a splash of color but makes the room smell wonderful as well. The candle dish ensures that I don’t damage my wood furniture with the heat and gives it a more refined look. 6. Prioritize your spending: I am a very practical sort of decorator and have definite ideas of what I am willing to spend my money on. Organic sheets are worth every penny I spend but artwork for the walls has never been important to me. However, the big blank space over my bed was just screaming for some sort of decoration. 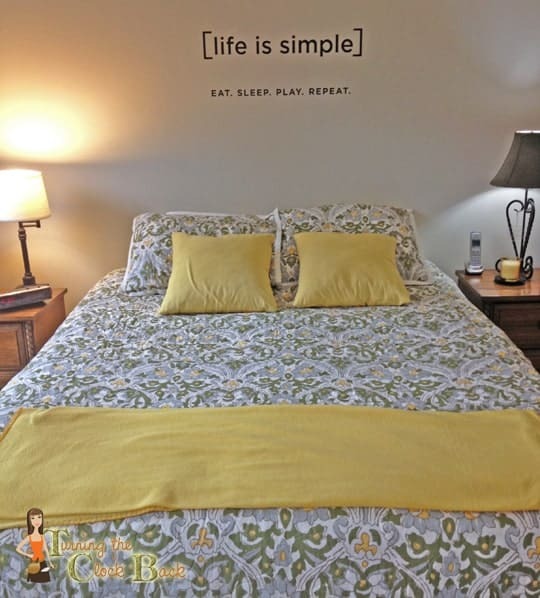 I chose to put up a very simple wall decal that was inexpensive and easy to apply. The wall decal also appealed to my sensible side because it couldn’t fall off the wall in the middle of the night and cause bodily injury! The Threshold line is very affordable but I still wanted to make sure I spent my money wisely. My kids were in awe of my newly decorated bedroom. My son actually told me that my bedroom looked like a hotel because all of the bed linens matched. I have never had matching bed linens before so I have to agree, this is a HUGE step up for my home decor! When reading through these simple decorating tips, keep in mind that everyone’s personal style will be unique. While I tend to have a practical nature, others might be more elaborate in their choices. The Target Threshold line will appeal to a wide variety of styles because of it’s range of colors and just the sheer number of items available. If you want to see everything that is in the Target Threshold line, check out the Target website. You can also just head to your nearest Target store to see what items they have available. I hope these these easy decorating tips help you bring a bit of style into your own living space. I loved the items I found in the Target Threshold line and my bedroom now has a completely different look to it. The colors are light and airy, with a simplicity that I really like. The prices were very reasonable and I had no trouble staying within my budget on the items that I most wanted to replace. Of course, I found a number of items that I put onto my wish list including some very attractive storage benches and ottomans. 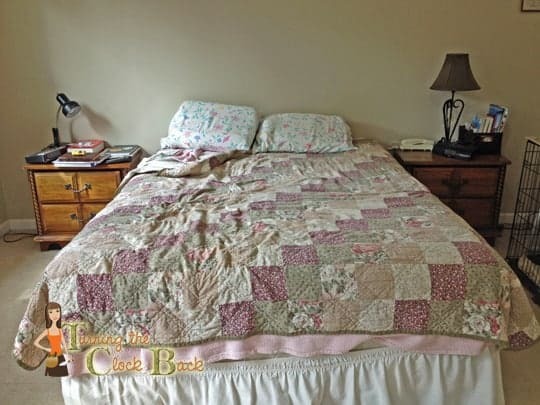 I want somewhere to store our extra blankets when we don’t need them on the bed. With spring coming so quickly, adding a little bit of style to your indoor space is a great way to finish off your spring cleaning and organization. 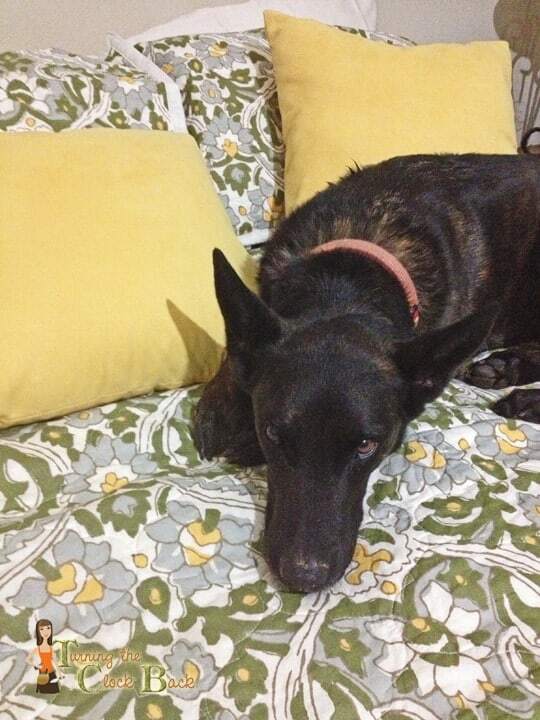 Now, if I could just find a way to keep the dog from hogging all the newly decorated space on my bed! I love target and I think the new bedroom look looks great! Oh my goodness, I love your transformation! Those are fantastic tips and will really help me out this year as I am trying to redesign my master bedroom too! Thank you! This transformation is gorgeous! I absolutely love it! I love the spread, great job on the decorating. I really like how you pulled it all together. It looks incredible! My current comforter is from Target, but it's probably 10 years old. Maybe I need an update too! It's funny how the things on your nightstands make a huge difference!